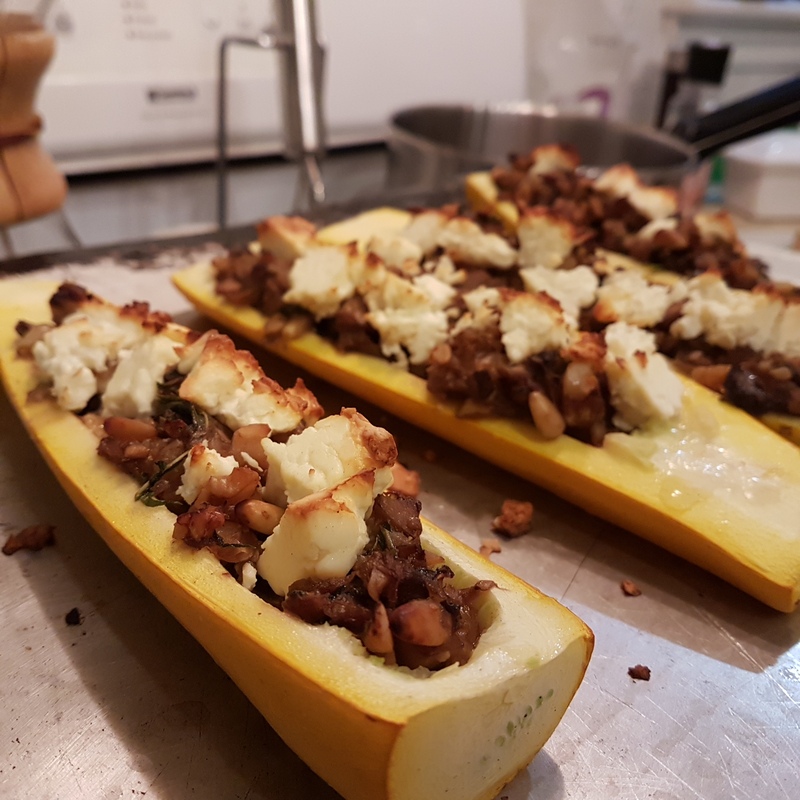 I’m a fan of stuffed zucchini in many forms, but usually when faced with a blank slate I go straight for Italian seasonings and lots of cheese. This year, maybe it was the bright yellow of our garden zucchini that had me thinking of stuffed zucchini in a different vein. I could imagine the earthy taste I wanted and just had to make it so. And make it so I did. I love this recipe first and foremost because it’s delicious, but also because it is easily gluten-free, soy-free and uses nuts. I feel like we don’t use nuts enough in main dishes and sometimes I get sick of beans and tofu and other vegetarian protein sources. I am not a real fan of mushrooms but this recipe needs them. I used the mild cremini, but if you’re a mushroom aficionado, feel free to go wild! (That’s a foraging pun, btw). I could see these being good with chopped Portobello mushrooms as well, if you’re into that sort of flavour. For a complete meal, I like to serve these zucchini boats with wild rice. Preheat the oven to 375 degrees Celsius. Cut zucchini in half lengthwise. Scrape out the fleshy/seedy part with a spoon and chop it. If there are large seeds, discard them. Heat olive oil over medium heat and add chopped onion. Saute for a few minutes, until translucent. Add chopped mushrooms and zucchini flesh. Stir and cook. Add a few splashes of soy sauce and stir to prevent sticking. Add oregano. Add toasted pine nuts and chopped walnuts. Cook and stir until all veggies are soft. Taste, and add a splash of balsamic vinegar (or lemon juice) if needed. Place hollowed out zucchini halves on an oiled cookie sheet. 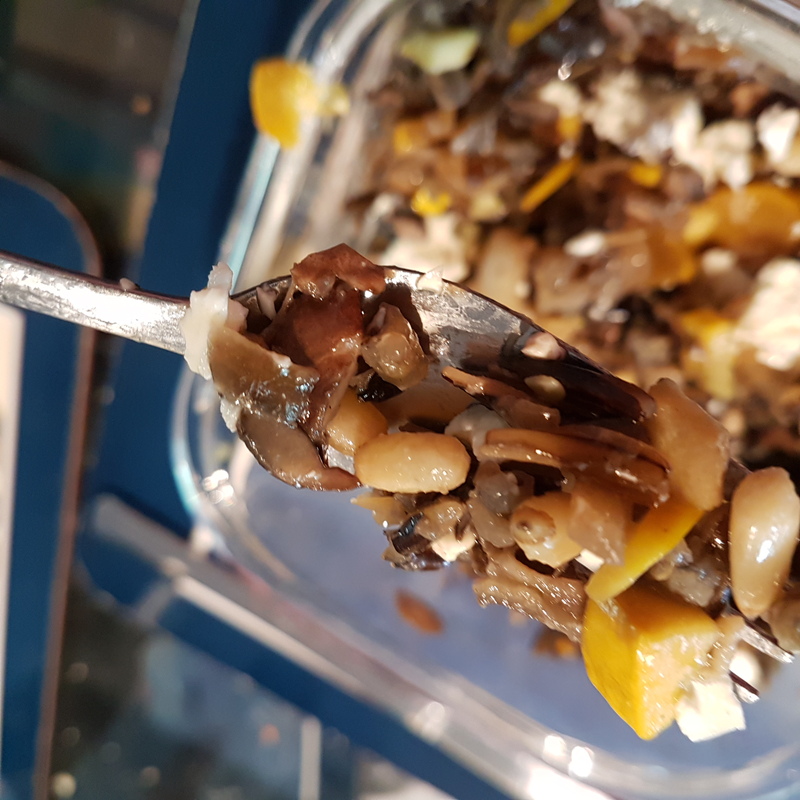 Fill with mushroom mixture and top with feta cheese. Bake for 30 minutes, zucchini is soft and cheese is slightly golden brown.